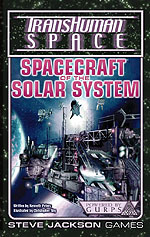 28 different space vehicles and variants for the Transhuman Space setting, including both warships and civilian craft. Special ships include the Nadezhda bioship (a cybernetic organism combining machine with living flesh) and the rogue autonomous kill vehicles left over from the Pacific War . . . artificially intelligent spacecraft with built-in bloodlust. These spacecraft can be adapted to any science-fiction background or roleplaying system. Transhuman Space: In the Well – In the Inner System, the worlds are closer together. Hotter. Full of promise and adventure.